Oklahoma School for the Deaf Superintendent Larry Hawkins poses in March 2018 with scissors used to cut a ribbon symbolizing the dedication of the Larry Hawkins Activity Center. SULPHUR, Okla. – Sulphur educator, community leader, friend and family man Larry Hawkins passed away unexpectedly on Saturday, February 23, after a brief illness. Hawkins is the only person ever appointed to a second term as superintendent of Oklahoma School for the Deaf, which dates back to its origin in 1898. A beloved teacher and friend who was well-respected in the deaf community, he initially retired in August 2011 as superintendent at both OSD in Sulphur and Oklahoma School for the Blind in Muskogee. Both schools are divisions of the Oklahoma Department of Rehabilitation Services. Hawkins responded to a request to return from retirement in March 2016 as interim OSB superintendent and agreed in June to lead OSD on an interim basis at the same time. He officially started his second term as OSD superintendent on August 8, 2016. Hawkins served for 14 years as OSD superintendent, nearly three years as OSB superintendent, one year as an OSD administrator and six years as a classroom teacher. “Larry Hawkins was a true friend as well as a highly regarded co-worker, who will be deeply missed by the deaf community,” DRS Executive Director Melinda Fruendt wrote in an email announcement to DRS staff. During his time at OSD, Hawkins spearheaded interior design improvements to make student dormitories more welcoming. He constructed apartments for parents and visitors and honor’s dorms to allow youth to experience greater autonomy and prepare for transition to life after high school. He established a statewide Interpreter Training Program at Oklahoma School for the Deaf. He worked with Oklahoma State Department of Education to reinstate the Enriching Children’s Communications Opportunities (ECCO) program, which helps families with deaf and hard of hearing children, ages 3 through 6, develop essential skills and navigate the world of hearing loss. Hawkins was honored March 14, 2018 by family, friends, students and co-workers with a surprise building dedication of the Larry Hawkins Activity Center. 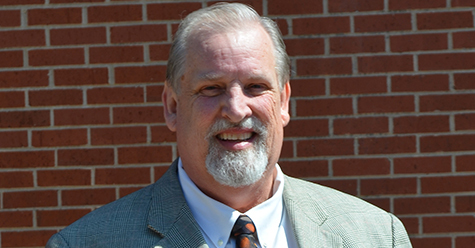 Prior to his time at OSD, Hawkins was director of deaf education at the University of Science and Arts of Oklahoma. He served as coordinator of support services for the deaf and as an associate professor of deaf education at USAO for 22 years. He earned his superintendent’s certificate in 2000, a master’s of science in communication disorders from the University of Oklahoma and a bachelor’s of arts degree in English from East Central University in Ada. Hawkins also held national certification from the Council on Education of the Deaf, state certification in Deaf and Hard of Hearing education and a standard teaching certificate. Hawkins is survived by his wife Patricia Lindsey Hawkins, and children Andrea Hawkins, Chickasha ; Jill Hawkins and fiance Jon Christian, Duncan; Paul Henderson and wife Belinda, Lawton; and Kristin Pendarvis and husband Dale, Tifton, Georgia. The Hawkins have 9 grandchildren, Kaicee Hobbs and husband Brandon Ewy, Lane Brady, Adam Hawkins, Ty Brady, Georgia Vester, Gillian Vester, Samantha Morgan and husband Justin, Michael Carr, Jr. and Kylee Henderson. The great-grandchildren are Chevy Ewy, Kaicyk Ewy and Adrian Carr. Hawkins was born the third of five children in Petersburg, Oklahoma. He is survived by brother Gary Hawkins and wife Sue, sister Lana King and husband Gerald, and sister-in-law Donna Hawkins. Preceding him in death were his parents Alvie Vernie Hawkins and Doris Mae Camplain Hawkins and two siblings, Verna Roberts and husband Dub, and Jeff Hawkins. Hawkins served at the state and national level on multiple boards and commissions, including the American College of Educators of the Deaf and Hard of Hearing, American Society for Deaf Children, Convention of American Instructors of the Deaf, Council on Education of the Deaf and National Association of the Deaf. He presented many times on deaf education and culture at the state, national and international levels and published dozens of academic articles focused on deaf education, deaf rights and other special education issues. Family was always the focus of Larry Hawkins’ personal life, but he also loved vegetable and flower gardening, cooking, collecting antiques and studying genealogy. Memorial services will be held at 2:00 p.m. on Wednesday, February 27, in the OSD auditorium, 1100 E. Oklahoma Avenue in Sulphur. He will be buried in the Ringling Cemetery following the service. Cemetery directions: https://tinyurl.com/y3bma8ud. Flowers may be delivered to Boydston-Wilbourn Funeral Home at 308 S.W. 3rd in Lindsay, 405-756-2143, or to OSD. Those who wish to make donations can send them to the OSD Foundation, 1100 E Oklahoma, Sulphur, OK 73086.